As the newest torchbearer for the SJ30 program, San Antonio, Texas-based SyberJet (Booth 4259) brings a little swagger to this year’s NBAA convention with the debut of a mockup of the company’s new flight deck clearly inspired by high-end (and fast) automobiles. Designed by Jason Castriota, whose portfolio includes work at Ferrari, Maserati and Audi, the look emphasizes sweeping shapes, rendered in high-level materials such as Alcantara faux suede, brushed aluminum and carbon-fiber veneer. Thick red stitching contrasts against black leather along the top of the panel. 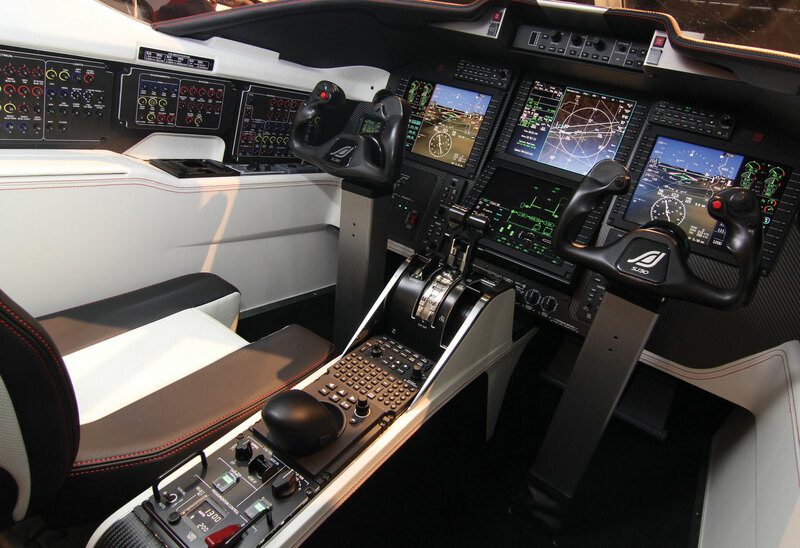 Housed in the new panel is a variant of Honeywell’s Primus Epic 2.0 avionics package, dubbed SyberVision, featuring four 12-inch displays and standard SmartView synthetic vision, TCAS II, Taws level-A and electronic checklists. The avionics also support FANS 1A equipage and the addition of Honeywell’s SmartLanding, SmartTaxi and SmartRunway systems. Fairchild said the avionics decision was between Garmin and Honeywell. While the latter company had also supplied the Epic flight deck on the first SJ30-2s delivered by prior caretakers Sino Swearingen and Emivest Aerospace, the company also took a long look at Garmin’s touchscreen-controlled G3000 system. “It worked very well,” Fairchild recalled, “[but using] the touchscreen controllers presented some issues in turbulence. It seemed like the workload was increased.” Fairchild also believed the Honeywell FMS layout was better suited for the SJ30’s emphasis on long trip legs flown in the upper flight levels, and appreciated its inclusion of an inertial navigation system (INS). Citing the tendency for past entities of the company to “overpromise and under deliver,” Fairchild was reluctant to comment on such questions as the size of SyberJet’s order book for the SJ30 or a target date for deliveries to resume. He did admit the company suffered a setback earlier this year, when a vendor failed to deliver a new wiring layout on SyberJet’s schedule, prompting the company to bring that work in-house. Nevertheless, Fairchild believes more realistic goals will allow SyberJet to achieve the market success that has eluded the SJ30 to date. Instead of delivering 100 airplanes per year, Fairchild said the goal is to deliver 24 aircraft annually with the focus on a more personalized sales pitch for each prospective client.